Sensational director SS Rajamouli had created records with all his past movies. Now he is doing new project called 'Eaga' with Nani, Samantha and Sudeep as lead roles. 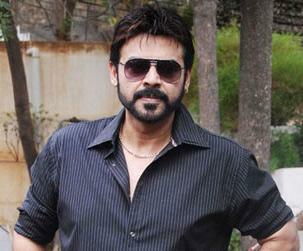 Now the latest news is that, Victory Venkatesh is giving voice over for Rajamouli Eega movie. The news is officially confirmed from the makers. The film revolve around 3 characters hero, heroine and Villain. Due to some reason Villain kills the hero. After some days hero will reborn as 'fly'. This fly remembers the past life and tries to take revenge on Villain. How this 'fly' takes revenge on Villain is all about the story of film. The film is expected to be hit the screen by 2012 summer. Earlier film makers plans to release the movie on December 2011, but due to loads of visual effects in the film it's delayed.